Fr. Christopher Moore presents a gift of vestments to Fr. George in Gulu as part of an OCMC Mission Team to Uganda made up of nine seminarians from St. Vladimir’s Seminary. 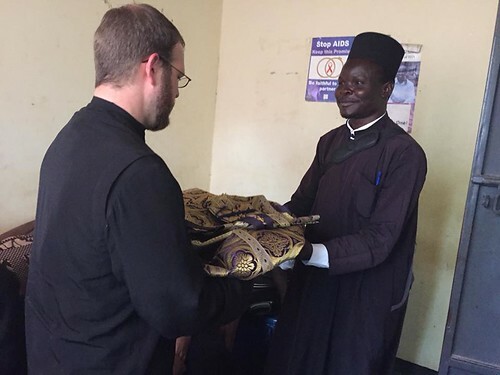 On May 23rd, the Orthodox Church of Uganda welcomed an OCMC teaching mission trip comprised exclusively of 9 seminarians to share the Orthodox Faith with their Ugandan brothers and sisters in Christ. The team stayed in the country for almost two weeks, moving from different communities in Uganda, teaching, preaching, anointing, and comforting the people they visited. The team, all students from St. Vladimir's Orthodox Theological Seminary, was led by Fr. Christopher Moore, a recent graduate from the seminary. On arriving in Uganda, the seminarians were welcomed by the Vicar General, Rev. Fr. Paul Mutassa. They had breakfast the following morning with His Eminence Metropolitan Jonah at St. Nicholas Orthodox Spiritual Center, where they received blessings to fulfill the mission of proclaiming the Gospel, teaching, and preaching in all parts of Uganda. The team participated in a two-day clergy retreat attended by 50 priests at St. Spyridon Orthodox Church in Nzinze, Eastern Uganda. The seminarians shared with the priests how to serve like Christ, the one mission of the Church even during times of difficulties they may be facing. The team brought with them sets of vestments that were gifts from Very Rev. Fr. Chad Hatfield and Rev Fr. Alexander Rentel of St. Vladimir's Seminary. The vestments were presented to the priests, and the altar boys’ robes were given to Archangel Michael Orthodox High School. Many people who came for the teaching also received health care by a medical team led by Susan Nelson from St. Luke Church in Colorado. Another special moment was singing the Pentecost Troparion in Luo, translated by Dcn. Simon and set to music by Fr. Christopher before coming to Uganda. Parishioners who heard the singing were amazed at how wonderful the team members sang in Luo! If you have been called by Christ to support Orthodox Missions, please contact the Orthodox Christian Mission Center for more information by e-mail at teams@ocmc.org, or call 1-877-463-6784 to learn how you can get involved and help spread Orthodoxy throughout the world.